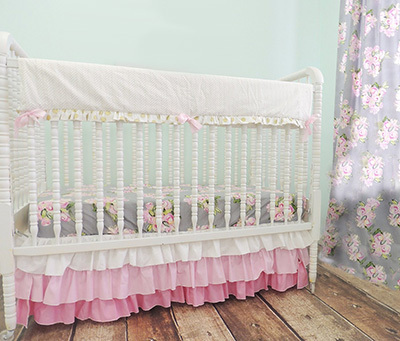 I had been looking high and low for a set of shabby chic baby bedding for my daughter's nursery ever since I found out that I was definitely (as an ultrasound can be)expecting a girl. My vision of decorating a vintage nursery filled with faded chintz fabrics with pretty roses was finally going to happen! This came as a surprise since I had felt since early in my pregnancy that we were having a boy. I was wrong and my intuition had failed me but I didn't care; I was ready to decorate. We are just starting our family so we knew we wanted to get as much mileage as possible out of our nursery's furniture. Our initial plan was to buy shabby, vintage nursery furniture and just change out the crib bedding and decorative items with baby while keeping the basic nursery design. Then, when I started shopping I saw that all of the nursery bedding sets that might work in a vintage setting were in colors for a baby girl. Just when I was resolved to buying fabric in colors for a baby girl to either make my own baby bedding, I came across a set in dark pink (or rose), grey, green and gold. The fitted crib sheet even has a a vintage floral print with cabbage roses that I will have to toss when when finally get our baby boy but that is alright as it will probably be ready for the trash bin by that time. I had planned to make my own dust ruffle but this one is too perfect to replace. To me, it looks like it was made out of remnants of a funky, hippie chick's skirt right out of the 1960s and the layers of ruffles gives it a lovely, sentimental look. The crib set is a little more expensive than I had budgeted for, but if I use it for more than one baby it doesn't look so bad...not cheap but better. AND I'm getting a set of sweet baby bedding that is everything that I've dreamed of. The only thing is that is not organic, I doubt I could do any better if I had bought fabrics to make the shabby chic baby bedding set myself. Thanks to Unique Baby Gear Ideas for all of the tips, tutorials and examples of homemade crib sets that have helped me find exactly what I want for my project. What is the difference between shabby chic and vintage décor? Can someone please explain it to me? Do you mean the eyelet or the gray part of the baby's crib skirt, Lacey? I really love your bed skirt and want that for my baby girls nursery. Where did you find it? I like your sensible approach. You can get a good quality crib bedding set that will last for years, and it doesn't have to be expensive. The sheets are the most important part because much of the rest shouldn't be put into the crib for safety reasons eg. comforters, pillows etc. shouldn't be put used with really little babies to avoid accidentally smothering them. So a good bedding set will last for quite some time! And you can get some beautiful crib sets.